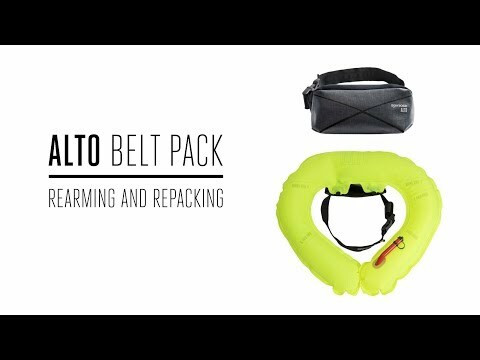 Designed for a range of watersports, the ALTO is a lightweight, compact, inflatable flotation device worn around the waist. Manually operated, the inflatable tube is released from the waist pack and then supports the user under the arms and around the chest. ALTO offers users such as SUP, Fishermen and small boat participants a simple, easy to use, tiny inflatable pack, that feels invisible when worn, yet is certified as a 50N Buoyancy Aid. Requires DW-RAK/75 re-arming kit which includes 2 x clips and 2 x 16g cylinders. ALTO is approved for adult users only (aged 16 years+) weighing over 40kg. This device is manual inflation only and requires secondary donning. Application: Swimmers only, sheltered waters help at hand, limited protection against drowning, not a lifejacket. Trained users only, requires secondary donning in the water. Minimum buoyancy when inflated 75N. Spinlock offer next day shipping when ordered by 1pm local time. However due to demand web orders are currently shipping 48hrs after orders placed before 1pm local. Orders shipping to UK address are sent on a next day delivery service. Orders shipping to addresses outside the UK are sent on 3-5 working day service. All orders will receive a tracking number. If you have any questions related to your delivery please contact orders@spinlock.co.uk. For full details please read our Terms & Conditions.